Harambee Stars legend, Dennis Oliech on Monday took his time off to visit Kenya’s ailing football icon, Joe Kadenge in hospital. Carrying flowers, a card and a basket of flowers, Oliech was accompanied by former captain, Musa Otieno and delegates representing Nairobi governor, Mike Mbuvi Sonko. His Exellency Governer Mike Mbuvi Sonko,Nairobi is blessed to have you,visiting Mzee Kadenge at Nairobi Hosiptal. Joe Kadenge is currently admitted at the Nairobi Hospital after suffering a stroke on Valentine’s day. The former AFC Leopards player was admitted at the hospital’s High Dependency Unit on Thursday afternoon, after he was rushed to the hospital by his children after developing complications in his Nairobi residence on Wednesday night. Happy Birthday Legend! Joe Kadenge Turns 83 Today!! This was not the first time the 83-year old suffered a stroke. He suffered a stroke In January 2006. We pray that he gets well soon. Kenya’s finest footballer, Joe Kadenge is counting his blessings as the legendary forward turns 83-years-old today. The AFC Leopards legend is already having an year to cherish, having realized his lifetime dream of watching his favorite English team, Manchester United play live at the iconic Old Trafford stadium. His once in a lifetime dream trip was sponsored by Black Arrow. Kadenge’s dream visit to one of the most iconic football grounds in the world coincided with the 60th anniversary of the Munich Air Disaster where eight Manchester United players perished. Kadenge revealed that the disastrous crash led to him supporting United for the past 59 years. In his once in a lifetime Old Trafford tour, he was lucky enough to meet David Beckham’s dad, Ted Beckham. Kadenge’s former club, AFC Leopards have sent out a birthday message to the man who revolutionized the club both on and off the pitch. Check out the message below. After a week-long tour of the United Kingdom courtesy of black arrow, legendary footballer Joe Kadenge is expected to jet back into the country. Kadenge enjoyed a once in a lifetime tour of the UK where he attended a live football match pitying his favorite side, Manchester United versus Huddersfield Town. United won the match 2-0 courtesy of Alexis Sanchez and Romelu Lukaku. Kadenge enjoyed a tour of the iconic Old Trafford stadium in a weekend which coincided with the 60th anniversary of the Munich Air Disaster where eight Manchester United players perished. Kenya’s finest footballer, Joe Kadenge had a weekend to remember in probably one of the best moments of his life. This is after the legendary footballer realized his dream of watching his favorite English Premier League side, Manchester United Live at the Old Trafford courtesy of Black Arrow. Manchester United were hosting Huddersfield United and wrapped up an emotional afternoon with a 2-0 win courtesy of Romelu Lukaku and Alexis Sanchez goals. When football legend Joe Kadenge walked into the Serena Hotel gardens for a press conference, he stunned many of the sports journalists seated waiting for him. “Nitaenda kucheza mpira huko juu, mbinguni kuna uwanja mkubwa sana,” Kadenge said, pointing at the sky as he walked towards the designated spot in front of TV cameras. This admission of his mortality brought tears to some journalists, who did not think it is a funny joke. This was not the last of his comments about the matter. The press conference was to announce that Joe Kadenge will be hosted by Manchester United at Old Trafford for the Manchester United vs Huddersfield match this weekend. This will be Joe Kadenge’s first trip to England and to a Manchester United game. On Sunday President Uhuru Kenyatta granted ailing football legend Joe Kadenge’s dying wish after he paid him a visit at his Nairobi South B home. The head of state was accompanied by Nairobi Senator Mike Sonko, culture CS Hassan Wario and other government officials. Kadenge who is known as Kenyas’ finest footballer made a wish to see the President last year, when he was admitted in hospital. He is suffering from diabetes. In his career, Kadenge played for Maragoli United, and scored the fastest ever goal in the Kenyan Premier League. He also played club football for Abaluhya United, winning the Kenyan Premier League in 1966. Kadenge managed the Kenya national football team in 2002. He suffered a stroke in January 2006. 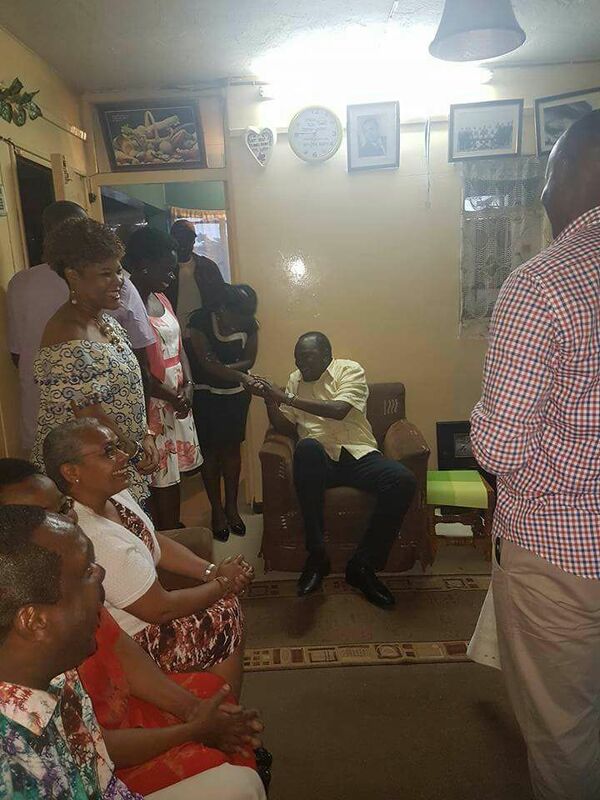 Cotu secretary general Francis Atwoli on Thursday visited veteran footballer Joe Kadenge at his home in Nairobi. Kadenge, who made history in Kenyan football as the best player and scorer, has been ailing for some time now. Prior to Atwoli’s visit, Kadenge had stated that his wish would be to meet President Uhuru Kenyatta “before he joins his ancestors”. “I am proud of my President Uhuru Kenyatta. I started playing football in Kenya when I was very young. I would like to meet him and talk to him before God takes me,” Kadenge told journalists who visited him. Atwoli described Kadenge as a resourceful person who made Kenya proud during his heydays as a footballer. “My brother and friend Joe Kadenge will remain in the annals of history in this country as an astute football player who made Kenya proud,” Atwoli said. He urged the state to establish a mechanism of supporting those who fly the country’s flag in sports after their retirement. The legendary footballer, after retirement, became bankrupt without any assistance from the government. He decided to venture into taxi driving until he started ailing, and hence relies on support from well-wishers. Ailing legendary football star Joe Kadenge has prepared a heartbreaking minute-long video with wishes he would like fulfilled before his death. The 81-year old suffered a stroke in January 2006. Kadenge collapsed at Camp Toyoyo grounds in Jericho, Nairobi, while watching a football match last October. As the Star reports, he was later hospitalised with diabetes and high blood sugar level complications but is now recuperating at home in South B estate. A fund raiser for his treatment will be held at Railways club on Friday. The former AFC Leopards player and Kenyan striker has requested to meet the President, whom he has wished well and asked to steer the country to success. “There are people in the government that I would like to meet. First and foremost, President Uhuru Kenyatta, I would like to meet you before I die,” he said. These are Daniel Moi and Mwai Kibaki. Kadenge said he would like to pay the three leaders his last respects before “God calls me”, to say goodbye and ask them to grow Kenya. The football legend said many of his friends have offered to accompany him to the meetings with the leaders but that it has been “really hard”. Kadenge played for Maragoli United and is known for scoring the fastest ever goal in the Kenyan Premier League. He also played club football for Abaluhya United, winning the Kenyan Premier League in 1966, and managed the Kenya national football team in 2002. Retired footballer Joe Kadenge was rushed to hospital on Wednesday after he fainted and collapsed at Camp Toyoyo grounds in Jericho, Nairobi. The former Harambee stars coach told the Star that his situation could have been precipitated by the fact that he had not taken any meal. Kadenge, who was watching a nationwide league match between Nzoia United and KCB, was rushed to Metropolitan Hospital by well-wishers. “Am currently at Metropolitan hospital having tests done. Am in good spirits but pray for me,” he said on telephone. Kadenge is regarded as the finest footballer ever produced by Kenya and decades later, the legendary player’s legacy lives on. Our thoughts and prayers are with the legend and his family and friends. Get well soon Kadenge.